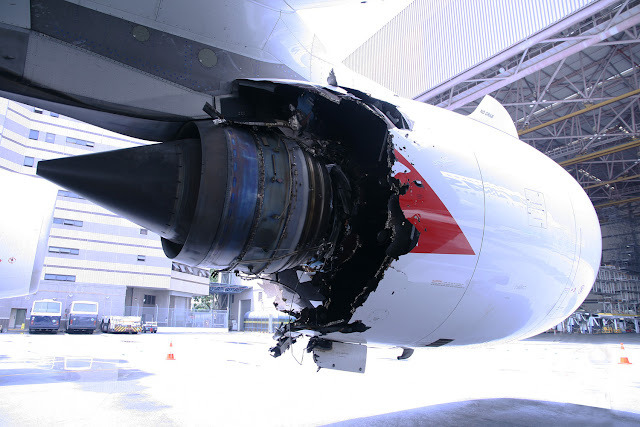 The following clip is the first part of a special looking at the Qantas Flight 32 uncontained engine failure. The cause, taken from the Wikipedia article, reads "[t]he ongoing investigation by the Australian Transport Safety Bureau indicated that "fatigue cracking" in a stub pipe within the engine resulted in oil leakage followed by an oil fire in the engine. The fire led to the release of the Intermediate Pressure Turbine (IPT) disc. It also said the issue is specific to the Trent 900". The links to the other three parts can be found directly below it.